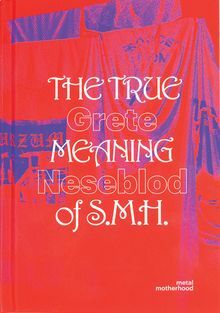 Evil and care, feminism and mothernism, anti-culture and the underground, misanthropy and life all are seemingly opposite yet are continuously recurring as themes in the life and work of Norwegian artist Grete Neseblod. As well as being a visual artist and a mother of three, Grete is the owner of legendary metal record shop Neseblod Records. This book features texts and images of Grete's solo show at Onomatopee, documentation of early works, an interview with Grete by Vincent Koreman, and a text about art and motherhood by Lise Haller Baggesen. So much hate, I'm shaking my head, but please, it's only nosebleed. Hardcover, 4.5 x 6.5 in. / 112 pgs / 56 color.